PHIL: The Boss wants me to come up with a new product that will allow him to save his reputation. he wants to be the most evil guy in the industry again. PHIL: The thing is, I came up with the most evil thing I could think of, and he… Turned it down. He actually told me not to do it. ALEX: Odd. What was your idea? 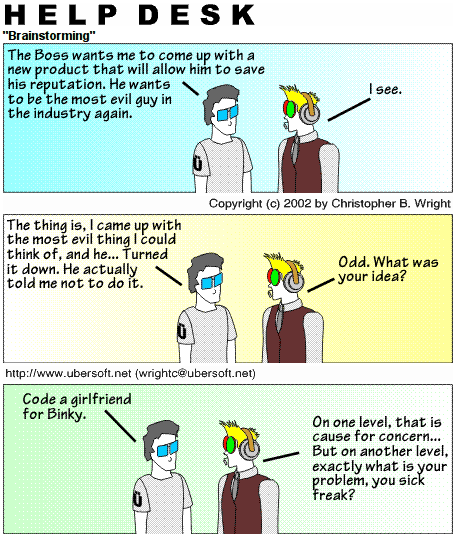 PHIL: Code a girlfriend for Binky. ALEX: On one level, that is cause for concern… But on another level, what exactly is your problem, you sick freak?